Innovation isn't something you do after you get your work done. It's how you do your work. Organizations all over the world are shedding jobs in record numbers. Yet today, they are desperately in need of people with the abilities and skills to think ahead of the curve, delight customers, motivate colleagues, slash costs, and achieve unconventional results. 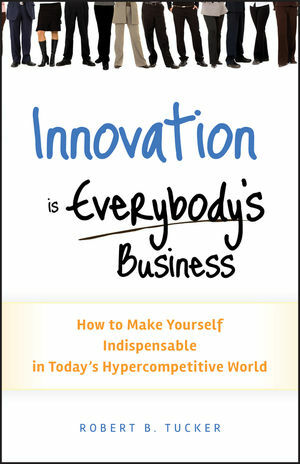 If you're ready to stop talking about innovation and start adding value today – in your job, department or organization – you're ready to read and benefit from the powerful message of Innovation is Everybody's Business. ROBERT B. TUCKER is one of the most in-demand innovation speakers and workshop leaders in the world today. Since 1986, he has coached and consulted managers, executives, and entire teams at organizations ranging from IBM to the U.S. Department of Veterans Affairs to Nokia. President of The Innovation Resource Consulting Group, with clients in 35 countries, Tucker is the author of six books, including the bestselling Managing the Future: 10 Driving Forces of Change for the New Century and Driving Growth Through Innovation. He lives in Santa Barbara, California.